Back on the Market – 6305 94 Street Country Club. BACK ON THE MARKET! Here's a second chance to grab this beautiful home, make sure you don't miss it. 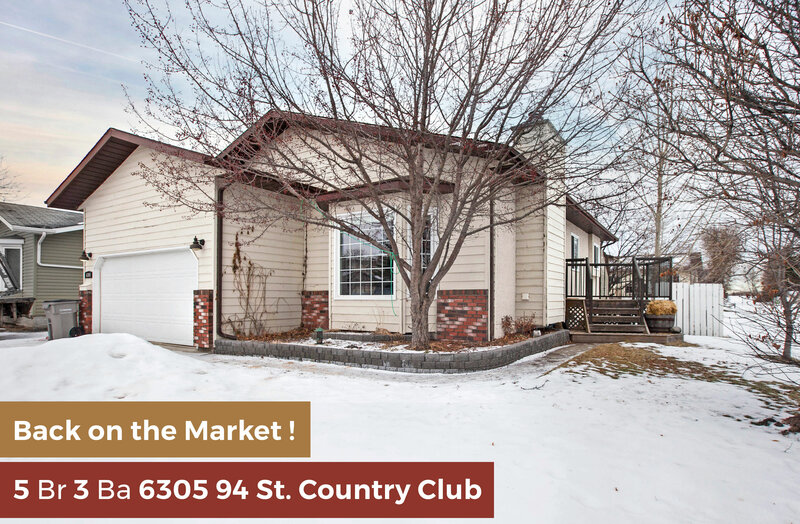 Call me 780 380 8769, now accepting offers - book a tour NOW before it's gone for good! 6305 94 Street Country Club. 5 beds 3 baths 1,303 sq. ft. This bungalow in a quiet, lush corner of Country Club has clear easements on two sides, giving it plenty of space for open views and greenery. Outside, there's the absolutely beautiful fenced yards and trees surrounding a newer deck, flowerbeds and a firepit area. Open concept layout with amazing use of color inside, with one of 5 bedrooms equipped with an ensuite and walk-in closet. Sunken living room with a classy fireplace mantel and airtight woodstove above, while basement blow has this amazing craft room with plenty of shelving and cupboard space. Really close to Aspen Grove and Montrose schools, too. Call or text me 780 380 8769, book a tour NOW before its gone. ← SOLD 12102 103 Street – 6 Beds on Corner Lot.